Mud is more than a messy inconvenience to feeding, watering, and cleaning; it harbors bacteria and fungi that cause serious skin and hoof infections, and is a perfect medium for the transmission of viral and parasite infections. It also contaminates runoff water with pollutants and sediment, which can degrade water quality in our streams and rivers and put you in violation of agricultural water quality laws. So what can you do about it? To start, you can learn techniques that work for other horse and livestock owners! You may not be able to completely eliminate mud, but you can greatly reduce the amount of mud by managing rain water and manure. Having mud issues? Contact Us! If you have questions about mud or what to do about it, please contact Julie DiLeone, our Rural Lands Program Supervisor. Install roof gutters and downspouts to divert clean water from the animal yard. A 1-inch rain on a 20-foot by 50-foot roof will produce 620 gallons of water; with 40 inches of rain per year that’s 25,000 gallons of water! Design gutters to handle and divert the rainfall in your area. Protect your downspouts from animal and equipment damage by using heavy polyvinyl chloride (PVC) pipe, a hot wire, or a permanent barrier. Make use of your stormwater! Empty downspouts into a stock watering tank or rain barrel, and direct any overflow to a vegetated area that the animals cannot access. Put new animal yards at least 100 feet from wetlands, ditches, and streams. Divert animal yard runoff away from wetlands, ditches, and streams and into a vegetated area that can filter the flow. Divert clean water above animal yards to wetlands, ditches, and streams. Close open ditches with a buried pipe to carry water past animal yards. Nose pumps tend to be one of the more economical ways of pumping water. Since the animals themselves supply the power for pumping, there is no need for power at the site. Nose pumps are small and light so they can easily be moved from one water source to another in rotational grazing systems. 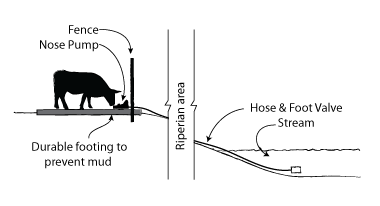 Have you been curious about using nose pumps for off-stream livestock and horse watering? Contact us to borrow ours. Install fencing to keep animals away from wetlands, streams, and ditches. Rotate water tank areas to avoid mud and manure buildup. Install Firm Footing: Create a heavy use area. A heavy use area made of geotextile fabric, gravel, and sand will provide an all-weather surface for you and your animals. 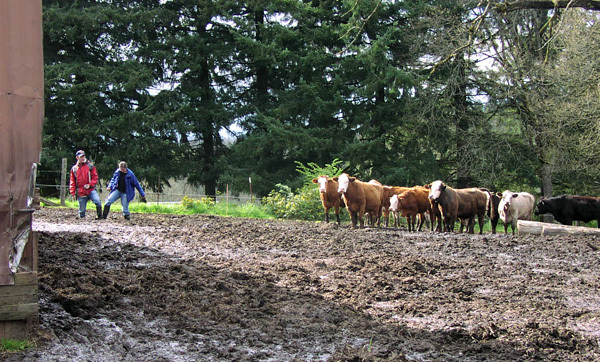 To reduce muddy areas and increase forage production, move animals into the heavy use area when pastures are wet in the winter or when grass is less than 3 inches high in the summer. Install heavy use areas on high ground and at least 100 feet away from wells and open water. The design of a heavy use area is specific to your site. We can help you save time and money by getting it right the first time. We have broad experience with the strengths and shortcomings of the various approaches to mud issues, and together we can tailor a cost-effective solution for your operation so that you won’t need to worry about mud next winter. Contact us now! You can also schedule a site visit.